Heath faces down oddities of all shapes and sizes in “Re-Ignition”. Poor Heath Huston. This guy could enter a convent and all hell would break loose. Trouble follows this sauced extra-terrestrial exterminator, known as a Fear Agent, as he travels across the universe and beyond in a seemingly impossible mission to save his home planet and, more importantly, his son. “Fear Agent: Re-Ignition” features a story that is packed with two-fisted action, but it also spends a solid portion of its space establishing a protagonist who is funny, engaging, and three-dimensional. Heath is an outsider from the Lone Star State whose inner monologues are as compelling as the numerous fracases of which he finds himself at the center. Writer Rick Remender may not be developing Heath into the friendliest cuss this side of the Milky Way, but he’s begun to etch out a man with a distinct soul who readers will be willing to follow across the stars. When Heath’s rocket is about to explode, in an act of mercy he turns off the artificial intelligence (named “Annie”) and is reminded of his wife. “I switch Annie off before I bail out. No reason to let her suffer. She flashed me a smile before I did it. It looked just like Char. It looked just like home.” As grizzled as Heath may be on the surface, Remender remains committed to exposing the depth and humanity that drives this Fear Agent, be it his wife or son. “Re-Ignition” opens on the planet Frazterga, after a brief but important prologue on a seemingly abandoned space station, where we are introduced to Heath as he leaps into a den of primates known as the Zlasfons, who are not entirely amused to have an unannounced visitor. These Cro-Magnons have been stealing technology from a nearby village and Heath has been contracted to retrieve the missing goods. As the action kicks in, Remender keeps Heath’s internal monologue going so readers have a strong sense of the character by the close of the first chapter. “My momma made me read Clemens,” thinks Heath as he approaches the nest of Zlasfons. “She used to tell me I was a restless boy and I needed philosophy to prepare me for the real world. I guess she couldn’t have known at the time that I’d end up usin’ philosophy to help me be reckless.” Heath is certainly reckless. 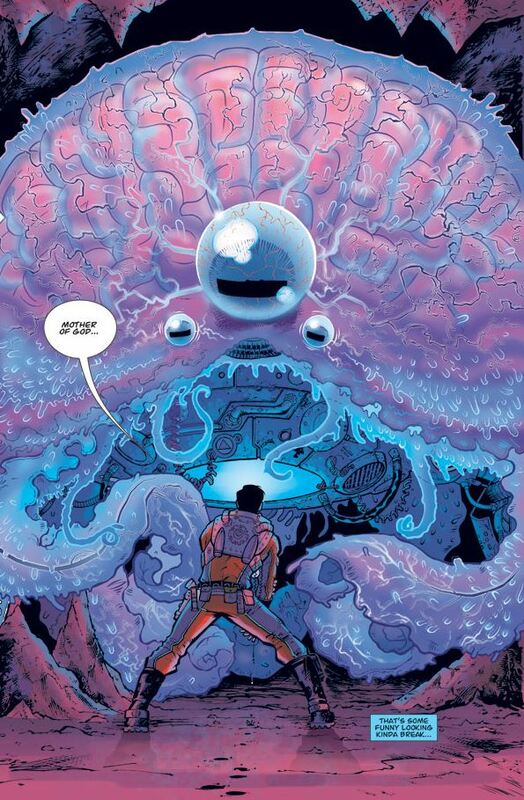 The Fear Agent is tackled by Zlasfons, nearly torn apart by tentacled creatures, gets caught in a gunfight with robots, and enters into a hand-to-hand battle with the robot king. Heath Huston is a walking death wish. Once properly introduced to our hero, we return to the abandoned space station with the cowpoke; this is where “Re-Ignition” truly begins. An especially nasty life-form is heading towards Earth and Heath, accompanied by a scientist named Mara, set off to do their damndest to save the third rock from the Sun. Remender has a great sense for action, but he doesn’t neglect his story by using blockbuster tactics as a crutch. The writer expands his universe exponentially with each passing chapter. “Re-Ignition” is rife with plots concerning interplanetary battles, civil war, and class struggles, all within the first short volume. There is a density to the world Remender establishes in his book, though the story never becomes too complicated or overblown. Remender knows how to write an action scene and Moore know how to draw one. Artist Tony Moore’s artwork is exquisite. He captures an exciting retro-tone for his character designs, weapons, ships, and architecture. Heath and Mara don big bubble helmets, rocket packs, and laser guns, à la so many 1950 interpretations of space explorers. Moore gives depth to everything, from the kneepads and wrist guards on Heath’s uniform to Annie’s battered panels, keeping the book from looking as one-dimensional as the material from which it was inspired. 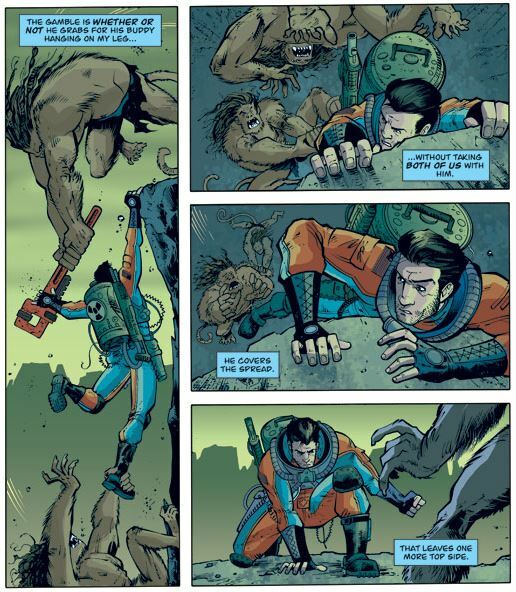 Moore’s character work is lively and dramatic, which is a necessity considering the amount of action Remender has included in his script. There’s a scene in the first chapter where Heath’s arm is hurt badly; for the rest of the book Moore continues to draw the arm in such a way that it is clear Heath is in great pain. Either it hangs there limply or Heath holds onto it as he races from the Zlasfons. It’s the attention to details such as these that make Moore one of the strongest artists of the medium. Unfortunately, the art grows a bit stiff when Jerome Opeña pencils some of the fourth chapter. While Opeña is a fantastic artist for certain, he’s drawing in the style of Moore and it isn’t as crisp and clean as his collaborator. Lee Loughridge brings a pop-art quality to the colors. All of the scenes appear as though they are lit by bright neon, shining from every imaginable position. The effect suits the artwork, granting this contemporary book a nostalgic style. Rus Wooton is on hand to fill the panels with enough bangs, whooshes and ka-booms to last a season of the 1966 “Batman” series. Remender rakes Heath across the coals of the quick but supremely textured “Fear Agent: Re-Ignition”. It succeeds because, as fun as the thrills are, at its center there’s an enormously captivating lead who finds himself in a plight that has us immediately invested. Now we just need to keep our fingers crossed that this guy can keep his head attached to his shoulders long enough to complete his personal mission. The physical trades are currently out of stock, but you may consider purchasing the first volume of the “Fear Agent” Omnibus.